Not all Urban Beer Hikes are created equal. Some include numerous breweries, making great contributions to The List. Others offer length, contributing much to our health. Our recent Halifax Urban Beer Hike added a little bit of everything, including six breweries to The List, a pinch of exercise, and a great way to see the city. 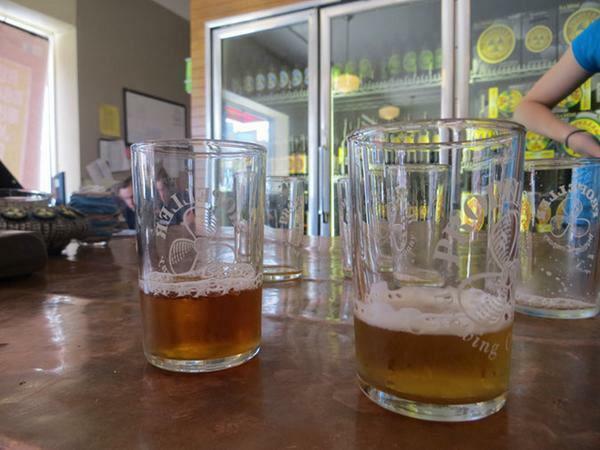 Propeller is a tasting room and bottle shop, no full pints for sale. So, if you aren’t lucky enough to attend one of their special catered events in the banquet room, plan on tasting and picking up your favorite bottles to go. Which is exactly what we did. A short distance away (if you don’t get lost) on the touristy Waterfront Boardwalk, we found Hart & Thistle Gastropub & Brewery. We sat outside on the patio shaded by a brightly colored Budweiser Lime-a-Rita umbrella. The weather had yet to break, so while we were happy to be in the shade, we continued to sweat bullets. Once again, I was looking forward to a refreshing brew to cool off with. Unfortunately, my choices were Columbus Double IPA (9.1%) and Ironhead Smoked Porter (7.2%). They don’t offer tastes, so we both went for the DIPA. Yes, even I did. I admit that between the touristy location and the forest of lime green Bud umbrellas on the patio, I wasn’t holding out much hope. We were pleasantly surprised, however, and the DIPA was very nice. More specifically, it was nice for Chris. I enjoyed one bitter sip, enough to appreciate it as a well-brewed beer. Chris was very happy, indeed, but a 9.1% beer was not exactly what he planned on for only the second stop on our UBH. The service was friendly and attentive, the view was nice and the beer done well. We also enjoyed our lobster salad and 3-dip plate. Hart & Thistle’s limited beer choice left me a bit deflated. So, with the recommendation from a friend, we hit Cow’s Ice Cream. So cool and creamy, it really hit the spot! 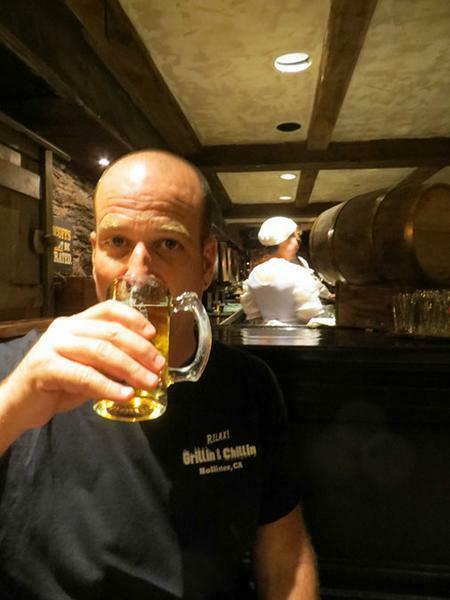 I was now ready for our next brewery–-Alexander Keith’s, North America’s oldest brewery and now part of the Anheuser–Busch InBev dynasty. You may be asking why we bothered visiting a macro-brewery. Well, there are several reasons. 1) We’re completists and it would be hard to know the brewery was there and not visit. 2) This was the original brewery and therefore historic. (We’ve also been to Coors in Golden, CO). And 3) Several people told us we HAD to do the brewery tour; that we’d love it! The tour lasted about 45 minutes and also included two small beers. I enjoyed (as much as one can) the Dark and Chris the Cascade Ale. Not sure it was worth the $19.95 each we paid for it, but as Chris says, at least we supported a few local actors. Walking further down Lower Water Street, we struggled to wrap our heads around what we had just witnessed. A beer was definitely in order. Fortunately, we were heading in the direction of Garrison Brewing. The longest leg of our UBH, our journey to Garrison Brewing gave us an opportunity to walk along the water and enjoy the view. The brewery was located at the end port where a cruise ship was docked. We relaxed at an outside table while drinking our taster set and watching people return to the boat. 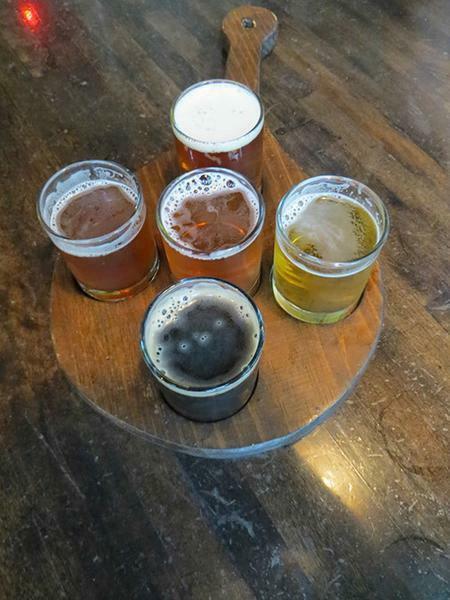 We tried 7 beers at Garrison, including all of their year-round brews (Wheat, Amber, Pale Ale, Irish Red, Nut Brown, American Red, and Imperial IPA). All of the beers were well-brewed, but of course, Chris liked the citrusy Imperial IPA (7% ABV, 81 ABV) best. I actually don’t remember which beer I liked best, but we did buy a few bottles of the Irish Red and the Hop Yard Pale Ale, so I imagine it was one of those. Walking all the way back to where we started earlier in the day, our next stop was Rock Bottom Brewing, right around the corner from our hotel. And no. Not that Rock Bottom. 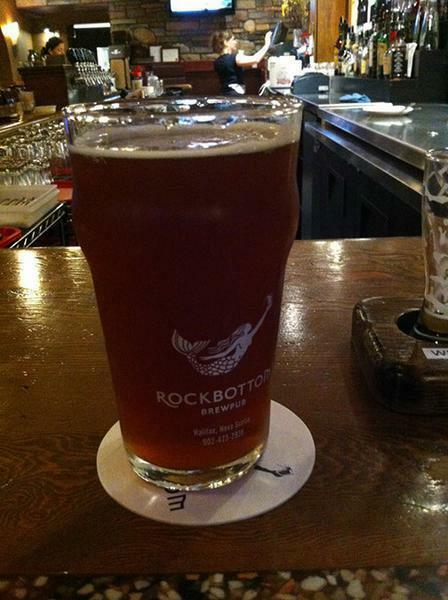 The cellar-level pub was a little dark and we weren’t sure what to expect from Rock Bottom’s beer. We sat at a cool booth-style table at the end of the bar. The first thing I liked was the logo, a mermaid with a pint. So much so that I think it may be my next tattoo. Then they had a Happy Hour boneless chicken wing special ($4 for 10 Thai chili wings). So far so good. Next came our 6-beer sample set…all I can say is that the beer was great! We tried the Wheat, Stout, IPA, and Brown, plus two seasonals: The Rookie and Broken Down SOB (Special Old Bitter). The Rookie was a hoppy American-style mild. Chris went wild for this Citra/Simcoe hop bomb, especially since it came in at a sessionable 3.3% ABV! I enjoyed the malty, biscuity SOB with our boneless wings. After 2 baskets of wings and a few beers, it was time for us to move on. We had one last stop to complete our halifax UBH. For our final stop of the day, we went a few blocks further from our hotel to Rogue’s Roost. A bit drained from the heat and humidity of the day, we decided to have a quick taster set and call it a night. 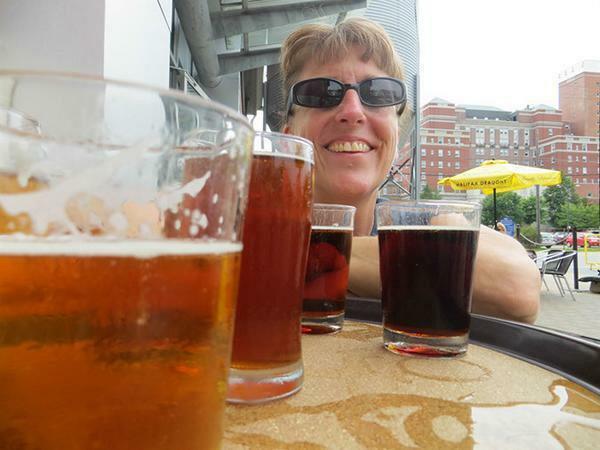 It included their five regulars: Red, Brown, Raspberry Wheat, Cream Ale, and IPA. The nautical themed atmosphere was pleasant and the other customers mellow, making it the perfect ending to a long day. 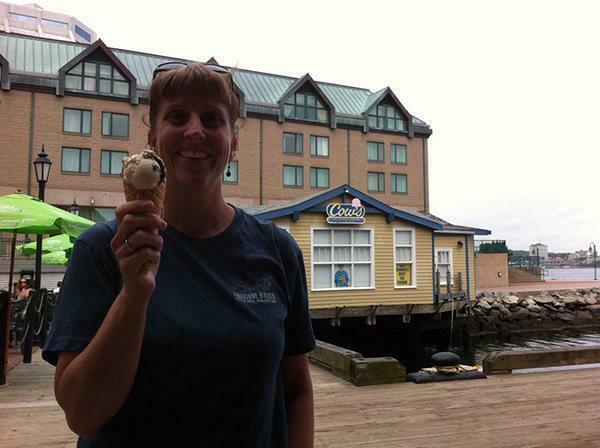 In spite of the humidity, our Halifax Urban Beer Hike was exactly what a UBH should be. 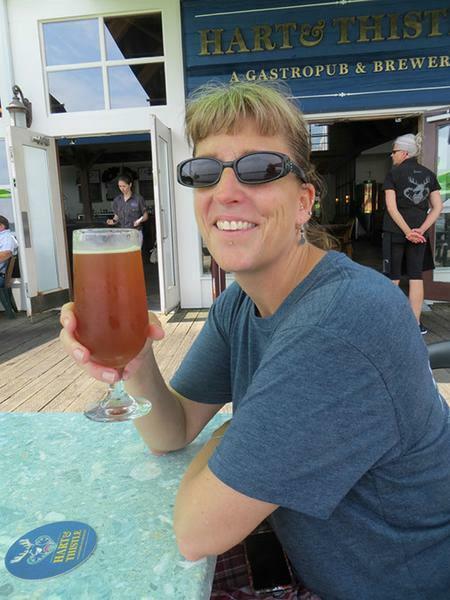 We experienced the breadth of Halifax breweries, saw different parts of the beautiful city, exercised a bit, and added breweries to The List. All in all, another great beer travel adventure.